The Pathfinder Role Playing Game!!! "It's an impressive amount of work and the approach seems good. I like it... It reminds me a little of our original idea of what the Rules Compendium was supposed to be" (Monte Cook, designer 3rd Edition, used with permission). Players searching through books at the height of your encounter, just to Demoralize an enemy. Determining the AC mods of a character Fighting Defensively? Figuring out the Armor Check Penalty of a Heavily Encumbered Chainmail-wearing elf trying to jump across a 10-foot chasm? Searching for all the details of one rule across four or five pages spread all over the place in your handbook.. Spending 45 minutes running a 4 round combat encounter. Then SORD PF is for you! All the attack types are found on a single page, from Attacks of Opportunity to Coup de Grace. Extensive details on EVERY weapon in the text. ALL on one page! There's even a Weapons 2 page that contains all the special rules for 24 weapons - from spiked chains and whips to nets and dwarven waraxes. Need a Banded Mail's Armor Check penalty because your hero is climbing a rope? It's on the armor class page with all the other important Armor Class modifiers. How about how to Bull Rush or Grapple. The mechanics and even the grappled and pinned condition information are found on one page. No flipping around in the rulebook! Confused about the Flanking rules with large creatures and reach weapons? That's covered too. Even skills are given a concise treatment. Every detail on one page, no fluff, just crunch! And so much more! Skills, Special Attacks, Damage, Weapons... it's in SORD PF. Did you notice all the examples mention a SINGLE PAGE?! 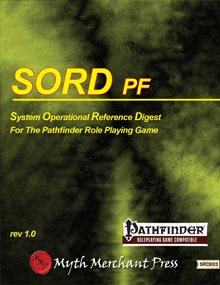 That's right, SORD PF has a 1-page design. For each major component, AC, Attacks, Damage, you name it, the rules are contained on a single page! Combat will speed up by 10-15 minutes per encounter.. Character generation is a snap. Players will try riskier, more amazing combat actions. Your game will be more fun, because you will spend more time playing! All in only 36 pages of crunchy goodness. Though colorful, SORD will work fine in Black and White mode. Extensively Bookmarked and Hyperlinked for online reference. SORD PF cuts right to the heart of gaming! Please, please, please update this to include the newer books. This is the best Pathfinder resource available (and is still a Gold Seller). A little additional effort would ensure it stays that way. Thanks for your consideration. It would seem that version 1.3 is the most current at this moment in time. I would like to know if there is a D&D 5th Edition version in the works some day. Thanks. I reach for this before the core book almost every time. Love this. Is there an update due? I think I read that there was work towards a newer version in the forums. I want to buy a couple of these for friends.